Generally better and more responsive user interface, updating all plugins windows immediately now. more informations shown, status bar, purpose of control/shift keys. better unit support, better user experience when working with fullscreen clips, mouse wheel support, better color settings. Big improvements in memory management of the audio samples, the audio clips auto-grow when needed. better undo history support. 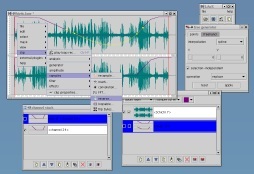 more playback features, winding and scratch play with cursor. and of course many bugfixes and other small improvements. Posted by Anonymous on Sat, 11/27/2010 - 11:11.
many many bugfixes and quality improvements (around 150 issues). Posted by Terry on Mon, 05/06/2002 - 22:08.